I was blonde for a moment. Actually – it was a pretty long moment. A moment that lasted almost 12 months. It was a great experiment, and I’m pretty sure I will go down that road again, but for the time being, I’m happy being a brunette again. It was raining today, or I should say – it is raining today and I had a particular itch to scratch. Brownies. 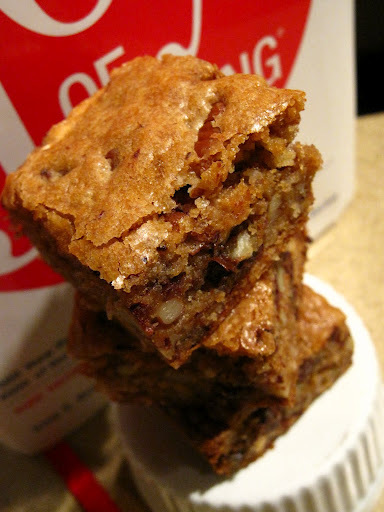 But I wanted to do something new (a la Kitchen Resolutions) so I dug up a recipe for blondies – the sister to the fudgy brownie. If the pastry world was like Hollywood, brownies would be Angelina Jolie and blondies would be Jennifer Aniston. The brownie is rich, luxurious, sinful, decadent, and at times, nutty. 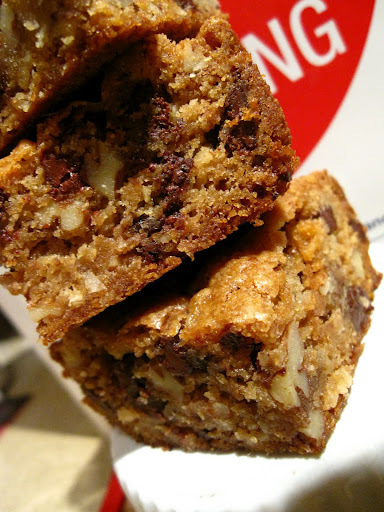 The blondie is lighter, sweeter – but is a mishmash of all different kind of nuts and chips. Cream puffs would be Jessica Simpson, of course. Light, airy, tricky to tackle at first, but SUPER-easy once you know all the shortcuts. Not to mention the gaping air pocket in the ‘head’ of the puff. Hee hee. I could go on forever – the chocolate chip cookie is like Paul Newman – classic, all-American, your go-to in an emergency, with a million different spinoffs and variations (see also: Jimmy Stewart, Robert Redford, Brad Pitt, Matt Damon). But let’s get back to business, shall we? 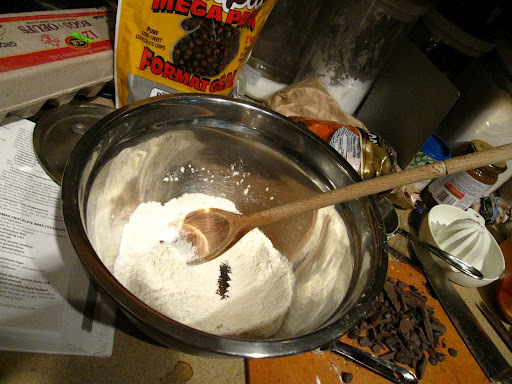 The aforementioned blondie contained some of my pantry staples – coconut, chocolate chips, and pecans. The recipe was taken from Joy of Cooking – I found one in Martha, of course, but hers was a bit too rich for my liking (5 eggs, I think, compared to 1.5 in JoC). The recipe calls for the browning of butter, which adds to the signature toffee colour of blondies as well as an added depth of nuttiness. I think it’s a technique that is underused and underrated in baking – it’s so simple, yet adds a multitude of dimension in taste! Perhaps I will try a browned butter cake next time! Mmmm…with maple icing. 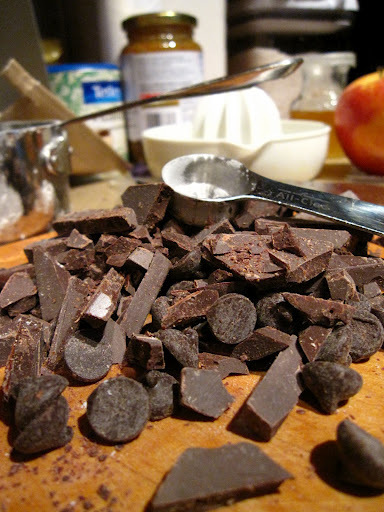 As with many other brownie recipes I have tried, the cooking time was tinkered around with. It really depends on what kind of brownie/blondie recipe you have and the kind of bar you prefer. For a fudgier brownie, it’s alright if it comes out a bit wet, but for a cake-type of bar, go for a clean tester. I don’t think a blondie lends well to being ‘fudgy’, so I wound up leaving it in for an additional 10 minutes. If you’re nervous about too tough of a crust, tent the pan with foil. Anyway, check out the results below.